If you live in or around Philadelphia, you may be noticing some new faces smiling at you along your commute! Adopt-a-Pet.com is proudly promoting pet adoption with three huge billboards and many posters on transit shelter stops, made possible by a generous $10,000 donation from the passionate pet lovers at Purina. The billboards (image at right) encourage people to visit Adopt-a-Pet.com, where great people and pet connections are made, while the transit shelter posters (see the poster below) alert people to easy ways to help homeless shelter pets right from their smart phones. 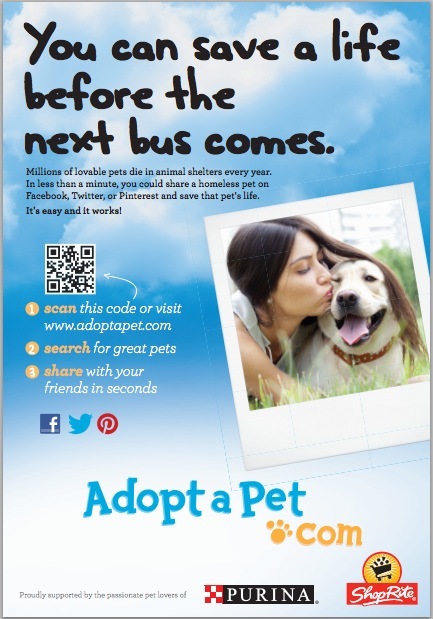 In the time it takes to wait for the bus, commuters can go to adoptapet.com, search for a homeless pet to help, and easily share that pet’s adoption information using the social share buttons Adopt-a-Pet.com has on every pet page. It is so easy, it saves lives, and you need not be in Philadelphia to take part! If you’re in the Philadelphia area and have seen the billboards or posters yourself, send us a Tweet and let us know what you think!